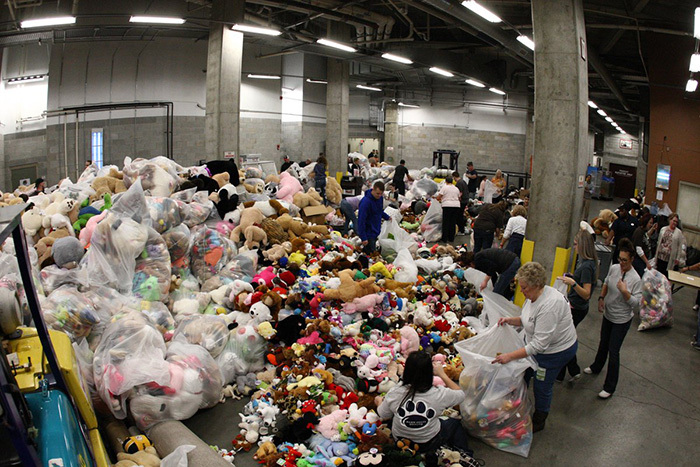 The Hershey Bears 2018 Teddy Bear Toss has broken a new record with nearly 35,000 stuffed animals thrown onto the ice. The Teddy Bear Toss is an annual tradition where hockey fans throw stuffed animals onto the ice after the first goal to donate to charity. Teams across the country participate in the tradition. The Bears announced on Twitter that Sunday’s Teddy Bear Toss in Hershey, Pennsylvania set a new world record, with 34,798 stuffed animals tossed onto the ice. The Bears say the stuffed animals will be donated to 30 different local organizations for distribution to needy kids. In addition to the toys, the night also produced tens of thousands of dollars in monetary donations. Pennsylvania charity CommunityAid had pledged to donate 50 cents per stuffed animal thrown (up to $15,000) and an anonymous season ticket holder pledged $1 per stuffed animal.